Artwork Description... 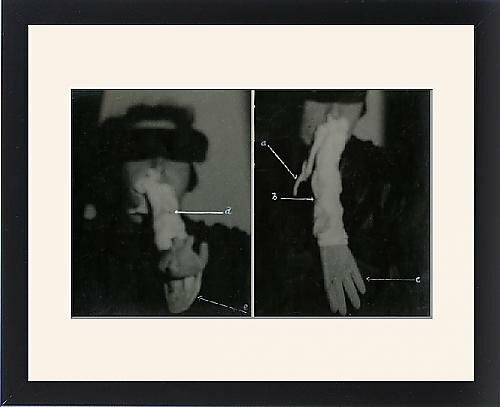 Piece of card showing two undated photographs of the Scottish medium Helen Duncan blindfolded during a sance, producing ectoplasm and a hand . There are annotations to show fraudulence. This are in a series of photographs of Harry Price s investigations into the mediumship of Helen Duncan and of Esson Maule, who was involved with the exposure of Helen Duncan during a sance in Edinburgh. HPG/1/4/3 (xiii) .